The Centers for Medicare and Medicaid Services (CMS) says they are completely prepared for new ICD-10 claims within the current system. Recent testing has claimed to be successful and resulting in no rejections other than those caused by human error. But what constitutes this system as “ready”? There is still a measurable amount of error in implementing both ICD-9 and ICD-10 codes into the system as it is currently programmed. Negative testing was employed as part of the testing process, explaining some of these statistics. Over 1,000 billing companies and healthcare providers took part in the testing process. No new ICD-10-related flaws were detected during this test period. The overall pass-through rate of claims did not change significantly in the new trial compared to previous ones. Preparations for implementing the system have included an official ombudsman for the ICD-10 program. CMS technical advisor Stacey Shagena declared the testing successful, adding that problems reported by contractors were fixed and did not re-emerge. Still, skeptics remain. 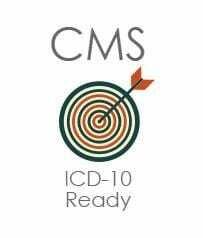 ICD-10 expert Stanley Nachimson has stated in previous interviews that there may be bias on the part of CMS about the overall readiness of the ICD-10 implementation as it now stands. He added that there’s no way to predict what would happen to groups that are not initially prepared for the changeover, or were not included in the initial study. Nachimson also stated that the lack of a significant change in pass-through rates compared to previous tests warrants more testing, not less. The statistics from past trials were used to discourage the changeover to ICD-10 as early as February 2015. Failure rates of up to 19 percent were reported, and are projected for future trials. These statistics aside, the scheduled changeover is due to take place on October 1. ICD-10 codes are a special classification of codes within the Medicare system. It was originally completed for use in 1993 by the World Health Organization. They are used for processing health information in a dozen countries, including Canada and the United Kingdom. Different countries have adopted the ICD-10 system at different rates. Information on the different codes within the ICD-10 system (as well as its organizational process) is available to the public.